Ahhhh.....Thai food, don't you just love it?!!! Urm.........99% of the time yes!!! But there are occassions when you just can't stomach noodles or fried-rice for breakfast. Or, when you're in the middle of the jungle, squatting over a toilet pan (the word toilet, being used in the loosest possible sense!!!!) 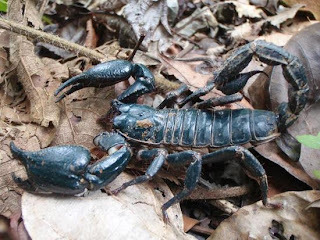 and watching a spectacle that is akin to muck spreading, the thought of eating a curried rat or portion of fried crickets is probably the furthest thing from your mind. However, despite the odd gastronomic hiccup, which has lead to me purchasing of immodium on an industrial scale and experiencing a burning sensation in the nether regions, giving a whole new meaning to Johnny Cash's "Ring of Fire", overall the standard of Thai food is exceptional. The sheer number of ingredients, flavours, aromas and textures are mind boggling, as are the different dishes and styles of cooking. Contrary to popular belief not all Thai food is so spicy it will melt your teeth!!! Thai food is known the world over for being bold and flavoursome due mainly to the herbs and spices that are used, such as chillies, lemongrass, garlic, corriander, "Nam Pla" which is a fermented fish sauce and "Kapi", a type of shrimp paste. The food varies from region to region, much the same as in the United Kingdom, although you won't find any deep-fried mars bars on the menu in Thailand!!!! 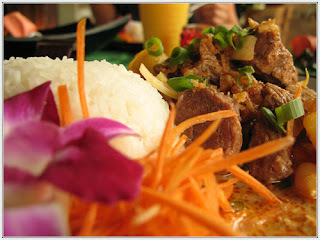 I have described the basic regional characteristics of Thai food in the following paragraphs. However, do bear in mind that I'm no Ken Hom and they are simply my observations from having visited numerous parts of the country and eaten more tucker than you can shake a stick at. Dishes that are salty and piquante are very popular and the taste intensity can range from very mild to fiery hot. You will notice a distinct absence of sugar or sweetening agents being used to flavour meals. Boiled vegetables and sticky rice are served with nearly every meal, together with, "Nam Phrik Oong", a hot sauce made with tomato, minced pork and chilli sauce. You will also find a lot of soups and curries like "Gang Kae", a chilli flavoured chicken soup. The North is also famous for a sausage made with fermented minced pork, called "Nham" which is sour in flavour and normally sold wrapped in a banana leaf. 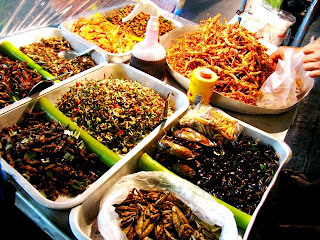 In some rural areas, creepy-crawlies like grasshoppers, crickets, ants eggs and silk worm larvae are also considered to be a delicacy. I have eaten a type of worm larvae called "Non Mai" and although it was an experience, I would much rather tuck into a "Zinger Tower Burger"!!! I have also observed that they use lots of wild growing vegetables and herbs. The infamous "Som Tam", a spicy green papaya salad, is probably the most famous dish from this region and just happens to be one of my favourites. The food is generally hot and salty with a sweet/sour theme running through it. Rice which is the staple food source in Thailand, is served steamed, with a variety of "Nam phrik" sauces. Soups like "Tom Yam Kung", a type of hot and sour prawn soup with lemon grass and "Gang Som", a chili vegetable soup feature heavily. The sliced beef sald known as "Yam Tua Pu" is also very popular. I have noticed that dishes usually contain a lot of spices and come served with many condiments. 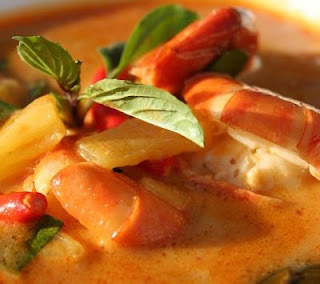 Thai Red Curry which has become increasingly well-known to diners in Western countries, orginated in the this area of Thailand. It is known locally as "Gang Phed". I really enjoy eating a fish called "Pla Too" and although you can buy this anywhere is Thailand, it is most common the Central region. I believe it is a species of herring but don't quote me on that!!!! Southern cooking is renowned for being very hot and sour. It's main influence comes from the mainly Malay-Muslim population. A popular breakfast treat is a "Roti" or crispy pancake. Personally, I enjoy the sweet version which is served with condensed milk. The most celebrated dish from the South has to be "Khao Yam". It is made by cooking a bowl of rice with roasted coconut, sliced herbs and a fish sauce called "Budu", it is often served with thin strips of a red flower called "Dawk Dala". In my humble opinion Thailand is one of the world's culinary centres and there are restaurants and eateries to suit every taste and budget. I am just as comfortable eating a bowl of noodle soup, sitting on a plastic chair by the side of the road, as I am eating in one of the glamorous restaurants in Bangkok. 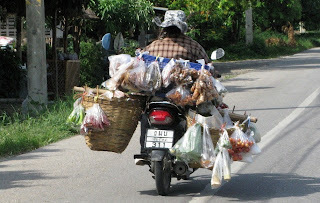 In thailand, you will notice that people will eat 4 or 5 small meals everyday, unlike in the West where we are rigid with our breakfast, lunch and dinner. I like to try and do the same whenever I'm visiting the country, as it gives you the opportunity to try a variety of dishes and means you don't over eat and suffer in the hot weather. I would strongly encourage people to eat food from the street vendors, push carts and ramshackle road-side restaurants!!! Western friends often express concerns about the standards of cleanliness when I eat a these places, but as I always tell them, if they were dirty or unhygenic then the Thai people who frequent them would be dropping like flies!!! So to experience traditional Thai food, be brave and give them a go!!!!! traditional style cooking and genuine hospitality. It means that if the restaurant is falling to bits they have been concentrating more on the quality of the food than on the decor!!!!! One piece of advice I always give to travellers is not to eat too many spicy dishes in the first few days you are there, gradually build up your intake of spicy food so your stomach has a chance to get used to the food. This way most cases of "Delhi Belly" can be avoided!!! 1) "Jim Jum": This is a lovely soup originating from the Isaan region, in the North of Thailand. It is prepared at the table in an earthenware pot on small charcoal burner. You can order a variety of meat and seafood which is then served raw on a plate, together with a basket containing eggs, sweet basil leaves, cabbage, celery leaves, spring onions and glass noodles. The combination of vegetables can vary between restaurants, as can the dipping sauces that are served with it, although the are usually based around garlic, chilli and lime juice. You then add the meats, seafood and vegetables to the pot of boiling broth and voila!!!! If you going to try Jim Jum, I would suggest you go to a local restaurant specialising only in this type of cooking, as they will give you the true Jim Jum eating experience!!!! 2) "Chicabub": This is typical street vendor fare, it consists of small skewers of meat, usually beef, pork or chicken, with slices of pineapple and chilli or jalepeno peppers. It is cooked over a charcoal flame on the back of the vendors motorcycle or cart, it will normally served with a slab of sticky rice that has been basted in butter and cooked over the charcoal grill until it goes golden brown. Aroi aroi (delicious, delicious) as they say in Thailand!!!! 3) "Som Tam": This is one of the most famous dishes in the whole country and you will find a "Som Tam" vendor on nearly every street corner!!! There are 2 versions, one which contains dried shrimps and peanuts and the other which comes with salted black crabs. The main ingredients are shredded green papaya, chopped green beans, tomato, chillies, garlic and lime juice. These are all pounded together in a pestle and mortar and then the black crabs or shrimps and peanuts are added. It is usually served with sticky rice called "Khao Neow". I welcome your comments on this post and do let me know if you have any amusing food related stories you would like me to mention.